The ‘Postgraduate Day’ is a one-day annual event held to convene graduates and academic staffs from different disciplines to discuss challenges they face during their candidature as well as after, encompassing relevant affairs pertaining to the faculty and the University at large. The event also aims to foster better relations between graduates and staff to constitute fraternal relations apart from instilling sheer academic acumen in the students. As much as this event facilitates orientation among the newly registered students and envisages on a path they will soon thread to reach the zenith of knowledge, it also aspires to prepare students to face the real world upon completing their tertiary degrees. ONLY 300 PLACES ARE AVAILABLE! Awe-inspiring talks from renowned speakers which are relevant to every graduate student who will be conferring to a tertiary degree and applying themselves in the 3rd millennium. Also, come and get tips on how to manage and maintain a healthy relationship with your SV! Lucrative door gifts and lunch will be provided! 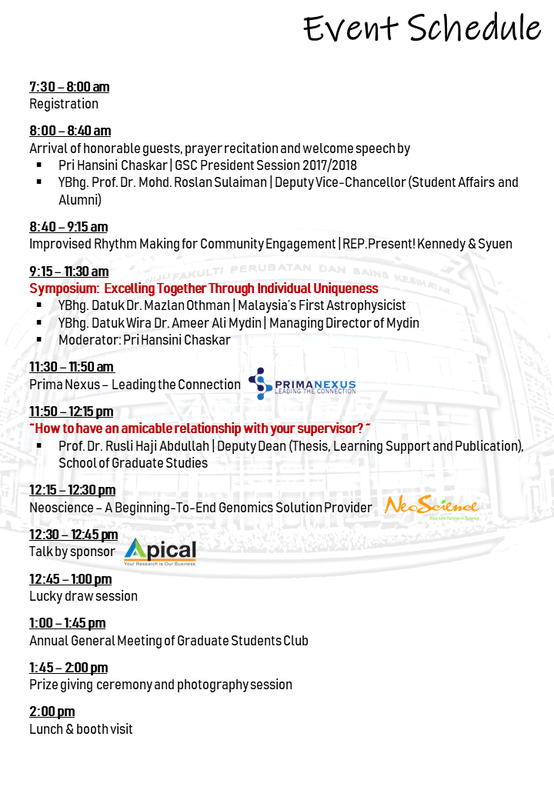 Details of the programme and the event poster are attached for your reference.